The decision to build a custom home gives you many advantages over purchasing one that is pre-built. One of the most obvious is that you have the ability to make all of the design choices for your new house. You will also create a home that is uniquely yours and build memories with your family that will last a lifetime. Here are some of the big benefits to building a custom home. Buying a pre-built home means arranging your life around the home that you purchase, making concessions to the design of the home. There is sometimes extra or awkward space that will never be used. You may find that you need a particular feature that the home didn’t come with. When you’re in charge of the design process, you are able to choose a layout and design that works for you and your family. If you like to sit outside enjoying your morning coffee, have a patio built outside the kitchen. 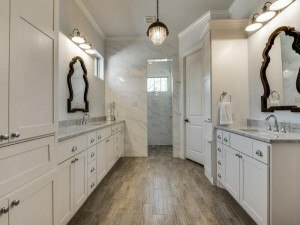 If you want your master bath or kids bathroom designed a specific way, you can do that, too. When you build a custom home, it’s all about what works best for you. See all the photos from this stunning custom home. When you purchase a ready built home, your only choice is to make do with what’s there and do your best to imprint your own style on the home. 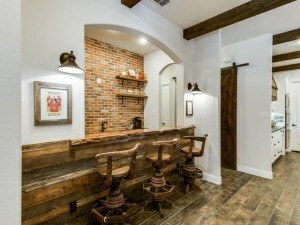 When you decide to build a custom home, you can choose whether the style of the home is rustic, modern, or another style that best fits your tastes. You can pick out cherry cabinets or cabinets with a glass front. If you want marble or granite counter tops, the choice is yours. Flooring can be carpet, wood, or tile from the beginning without the hassle of a remodel you’d do in a pre-built home. You make the decisions for every material and color choice. You’ll come home to a space that is exactly what you want, and visitors will be greeted by your signature style. Because you’re the one making the choices, you decide which brands to put in your house. If you feel that one appliance brand is better than another, that can dictate which refrigerator, washer, and dryer you choose. You can decide which cabinet builder you want to patronize and what brand of carpet to use in your home. Have the brands you trust with the quality you want to finish your home. Not only does choice extend to how your home is designed and what goes into it, you get to choose your contractor as well. The right contractors and builders will create a quality structure without cutting corners. They will keep you informed of the construction process every step of the way. When you build a custom home, the process can seem long and drawn out but the results are worth the wait. When you work with the right builder and have the freedom of choice throughout the process. The end result is a quality home that reflects your own personal style. Are you ready to build your dream home? Together, we can make that dream a reality. Contact us today to get the process started.